Plant species with physical seed dormancy are common in mediterranean fire-prone ecosystems. Because fire breaks seed dormancy and enhances the recruitment of many species, this trait might be considered adaptive in fire-prone environments . However, to what extent the temperature thresholds that break physical seed dormancy have been shaped by fire (i.e., for post-fire recruitment) or by summer temperatures in the bare soil (i.e., for recruitment in fire-independent gaps) remains unknown . In a recent paper published in PLoS ONE , we tested these two alternatives in six woody species (21 populations) occurring in fire-prone areas across the Mediterranean Basin (Spain and Turkey). Seeds from different populations of each species were subject to heat treatments simulating fire (i.e., a single high temperature peak of 100ºC, 120ºC or 150ºC for 5 minutes) and heat treatments simulating summer (i.e., temperature fluctuations; 30 daily cycles of 3 hours at 31ºC, 4 hours at 43ºC, 3 hours at 33ºC and 14 hours at 18ºC). The results showed that fire treatments broke dormancy and stimulated germination in all populations of all species. In contrast, summer treatments had no effect over the seed dormancy for most species and only enhanced the germination in Ulex parviflorus, although less than the fire treatments. That is, the results suggest that in Mediterranean species with physical dormancy, the temperature thresholds necessary to trigger seed germination are better explained as a response to fire than as a response to summer temperatures (see Figure below). The high level of dormancy release by the heat produced by fire might enforce most recruitment to be capitalized into a single post-fire pulse when the most favorable conditions occur. This supports the important role of fire in shaping seed traits . Given that seed dormancy is heritable, demonstrating that it provides higher chances of recruitment (i.e., higher potential fitness benefits) in response to fire than in response to summer temperatures suggests the temperature threshold for breaking dormancy might be an adaptation to fire [1, 4]. 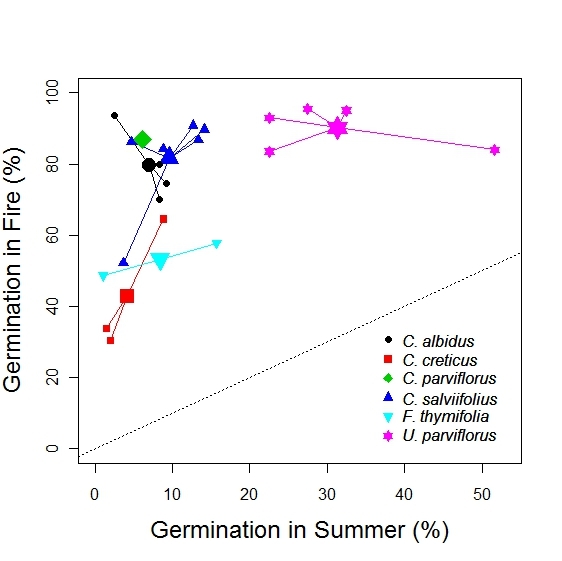 Figure: Germination (%) in fire conditions (y axis) versus germination (%) in summer conditions (x axis) for 6 species (21 populations across the Mediterranean basin). Intraspecific variability (i.e., among populations) is indicated by small symbols (mean population value) emerging from the large symbol (mean species value). The 1:1 line is also shown (dotted line). Species considered are: Cistus albidus, Cistus creticus, Cistus parviflorus, Cistus salviifolius, Fumana thymifolia, and Ulex parviflorus.